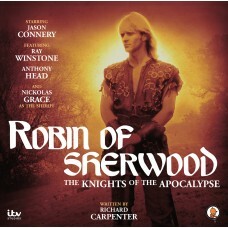 Robin of Sherwood - Returns in Audio! It appears one of the greatest, and most underrated, fantasy shows of all time is returning in an audio drama! For those not in the know, Robin of Sherwood was a British-made television show that ran for three seasons in the mid 1980s. It aired in the USA on PBS. It was a gritty and grimy show, in which Robin 'the Hooded Man' was the chosen soldier of Hern, god of the forest. While most episodes featured Robin taking on his traditional foes, the Sheriff of Nottingham and Guy of Gisborne, over the course of the show he would also battle a necromancer, a coven of witches, and other slightly horrific fantastical foes. The show had its issues, especially its sometimes dodgy soundtrack and lighting, but for a fantasy fan in the 80s, it was one of the best things going. A few of the episodes are pure genius. Anyway, thanks to a crowd-funding campaign, it looks like they've gotten the whole cast of regulars back together to do a two hour audio drama. Okay, I'm not sure about the title, The Knights of the Apocolypse, but it is still exciting news. I would love to read some reviews of this or hear from anyone who has a copy! Finishing up that Space Wolf encouraged me to do a little more painting on the Death Watch: Overkill set. Not wanting to tackle another time consuming, heavily detailed marine, I grabbed a couple of genestealer hybrid models and got to work. I don't want to spend huge amounts of time on the hybrids. They are cool models, but there are a lot of them, and they are essentially a 'horde of bad guys', and not really worthy of a lot of attention. (Also, as near as I can tell, they don't stay on the board very long in the game, as they are weak and crunchy!). I have a bunch of genestealers from previous games, and I have painted all of them using a colour called 'Middlestone'; it is sort of a muted, yellowy green. It was apparently a colour used by the Germans to paint some of their tanks in World War II, at least that is how it came to end up in my paint box. I thought the colour worked well for alien-insect monsters. So, wanting to keep my hybrids tied to my 'pure' genestealers, I used middlestone for the hybrid flesh. Left to my own devices, I probably would have never thought of using orange as the basis for their suits. Orange is not a colour I use very often, but I saw someone else use it for his hybrids and thought it looked pretty sharp. Also, it fit well with the idea that the hyrbids are asteroid miners who would wear hi-visibility suits. As you can see, for their armour, I just went with a grey drybrush and their guns are a pure flat black. I think they came out well, considering how much time I spent on them. Taking a break from my normal fantasy painting, I pulled this guy out of my Death Watch: Overkill box. He is a member of the elite 'Death Watch' Space Marines, a force drawn from different chapters specifically to fight alien incursions. According to the text, Death Watch Space Marines are suppose to wear black and silver armour with only their shoulder pad denoting their original chapter. That seemed like a wasted painting opportunity to me (plus I hate painting black), so I painted him in more-or-less normal Space Wolf grey with just his Death Watch shoulder pad in the black and silver. He's come out a bit dark in the photos, which is a shame because the figure has some truly great detail. He's also huge, towering over regular human sized figures, which is how a Space Marine is supposed to be anyway. It's a shame all of the ones in the box weren't that size. A fun diversion, but I think it is going to be a long time before I finish all forty figures that came with the game! As for the game itself, I can't comment. I haven't played it yet. This past Sunday, I was in the pretty Cotswold town of Stroud, for their early season softball tournament. It is the first softball tournament I've been to in a few years, and only the second with my Oxford Knights team. Seven teams came out for the tourney and each of them played four games. The Knights came as a bit of a hodge-podge team. We had a couple of old veterans, including myself, a couple of true rookies who had barely swung a bat in anger before, and a few players drawn from other Oxford teams to make up the numbers. Our first game was against the so-called 'Sons of Pitches'. I took the 'mound' in the game, and was rudely greeted by their big bats. Eventually, we lost the game 17-2. I went a disappointing 0-2 at the plate, while catching one pop-fly. Although it was a somewhat dispiriting loss, we learned a lot from the game and modified the line-up and the positioning for our next game. We had an hour break before our next game and had a nice picnic lunch in the quiet Cotswold town. The view of the high, rolling hills certainly made it the most attractive place I have ever played softball. Soon, the hour was up, and we went back out to the field. (All games in the tourney were about an hour long and thus tended to only go 5 or 6 innings). Our second game was against the 'Dragon Warriors', and was a much closer contest. I was pitching again, and had much better command in this game (walking no one as opposed to the two in the first game). I also had a much better game at the plate. going 2-3 with a couple of singles, and even got in some glove work, adding three assists. In the end, we lost 9-8, but it was a fun, competitive game. By the third game, we were definitely trending in the right direction. This time we took on the hometown Cotswold Chaos. I thankfully got a break from pitching for a game and moved over to third base. Our bats really came alive in this one, and we won 16-4. I added two more hits, again going 2-3, managed three put-outs, and one assist. The only down point was that my assist came after I essentially caught a hard grounder with my stomach after a funny hop. Still, a big bruise is one of the ways you know you've played softball! During game 3, a light misty rain had begun to fall, and by game 4 this was turning into a light, but steady rain (that's how you know you've played softball in England!). This game saw us take on the 'Red Sox'. Although we didn't know it at the time, it was actually a game for 3rd place in the tourney. I was back in the centre of the diamond for this one, and probably had one of my best games ever. I caught three pop-ups, and got for assists as well. (Being involved in 7 outs is a rarity for a pitcher!). I also went 2-2 at the plate, as part of our 8-4 win. It wasn't until the game was over, and the rain had thankfully stopped, that we discovered we had taken third overall, and would be coming home with a small trophy, another bit of hardware for the non-existent Knight's trophy case! A terrific way to spend the last official day of Spring! It was a good weekend for Fantasy Flight and Star Wars at the Origins Awards. 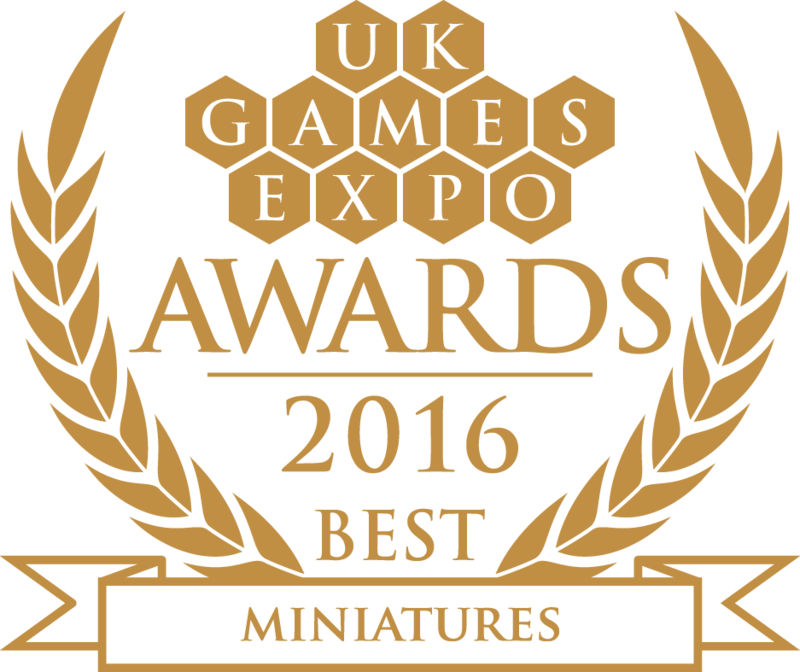 They picked up Best Board Game for Star Wars Imperial Assault, Best Role-Playing Game for Star Wars Force and Destiny and Best Miniatures Game for Star Wars Armada. This last one, of course, beat out my own Frostgrave. Well, as the title says, you can't win them all. While I am slightly disappointed, I have decided that my disappointment will end by the time I have finished writing this blog. I've already had a great year, picking up two awards, and, while the Origin award is probably more prestigious, I wouldn't trade it for the wonderful experience of picking up the UK Games Expo Award in person! 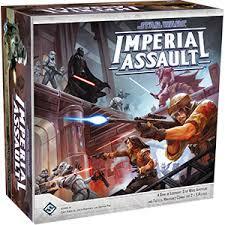 The irony of the whole thing - I have never played Star Wars Armada, but I have been sorely tempted by Star Wars Imperial Assault which looks like a great (board) miniatures game. I even picked up the Boba Fett pack for the game just to get the figure! Did you know that in the earliest drafts of The Lord of the Rings, the character that would later become Aragorn was actually a hobbit ranger with wooden shoes named Trotter? I'm not kidding, you can read all about it in The Return of the Shadow (The History of Middle-earth vol. 6) by Christopher Tolkien. Thankfully Tolkien thought better of this idea, and Trotter was consigned to the literary dustbin. Still, there is nothing intrinsically wrong with the idea of a hobbit ranger. We know for a fact that hobbits due produce the occasional adventurer. The hobbit ranger seen here is my latest completed figure (and the only figure I have managed to paint in some weeks). Although he's a Reaper Miniature, sculpted by Bobby Jackson, I think he fits in pretty well with the Games Workshop, The Lord of the Rings ranger standing next to him. Five years ago, I had over $7,000 in credit card debt. For months I had been carrying on, paying a bit here and a bit there, but never really making any progress. Most of the time, I tried to stick my head in the sand and just not think about it. Slowly though, the debt began to weigh more and more heavily upon me. It started to affect my thinking about life and the future, about what was possible. One day, while sitting in a dark mood, I thought to myself that I would trade everything I owned just to get out of debt. Suddenly, the mood lifted. I realized that I really would trade most of my possessions to get out of debt. 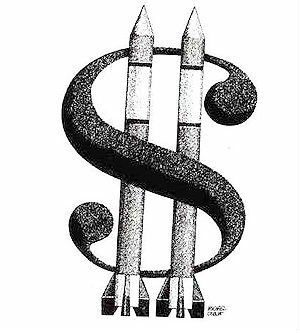 I determined then and there to launch a war against my debt, a war that I wouldn’t stop fighting until I had won. First, I needed to understand my enemy. Most credit cards, including mine, charged an annual percentage rate (A.P.R) of around 20%. (Personally, I think that should be criminal, but that’s a topic for another day). On a $7,000 debt that worked out to $1,400 of interest – every year! Of course, it was worse than that. Credit card companies don’t calculate your interest every year, they calculate it daily. Meaning your debt grows every single day, and because of that you are actually going into debt at a faster rate with each passing day! For my purposes I didn’t need to know the exact figures, it was enough to realize that each month I did nothing I was drifting around $125 deeper in debt. Or, to put it another way, if I paid my credit card company $125 a month, I would never pay off my debt. I would continue to pay this bill until the day I died, and then pass along a $7,000 debt to my wife. So that’s what I was up against. I needed to pay $125 just to stop the bleeding. If I was going to start pushing the enemy back, I needed more than that. I took a good look at my finances. If I was going to go to war, it was time to start rationing. Yes, it hurt to end my subscription to all of my magazines and to my Doctor Who audio adventures. The Sky television package got chopped down to the minimum. Movies, concerts, meals out, they all had to go. Tough times called for tough measures. This was war after all. When I got through with my monthly budget, I found I could put nearly £200 towards my debt. One advantage I did have at the time was the exchange rate between the UK (where I earned my money) and the USA (where I kept my debt). At the time the pound was worth about $1.50, which was a nice psychological incentive as it made all of the money I put towards debt feel like it was gaining an extra 50%! So, £200, which translated to $300 a month, more than twice what my debt was costing me. Not bad, not bad at all. However, at that rate it would still take me 3-4 years to pay off the debt, and in that time I would be losing all kinds of money to interest. Unacceptable. I determined that every month, I would find another $300 (just £200) to put towards my debt. I looked around the house, and started in the most obvious place – the lead mountain. Most miniature wargamers have a lead mountain, that gigantic pile of unpainted miniatures that you tell yourself that you will one day paint. In my heart, I knew that I would never paint most of them. So, I set out to sell them. To sell my miniatures I used a combination of Ebay and Lead Adventure. Ebay is great for collectable items that could possibly start a bidding war and sell for high amounts; however, its fees are also high. For more standard items, I used Lead Adventure, my favourite miniatures forum. I used the forum to make dozens of deals, and I can happily say I never had any issues with any of them. Occasionally, I worried about selling my minis, but I just kept telling myself that I could always buy them back if I wanted them (it hasn’t happened yet). In those first couple of months, it was remarkably easy to make money and to hit my target of paying at least $600 a month towards my debt. At first I would make a credit card payment immediately whenever I received money, then I ‘discovered’ that the credit card limited me to making five payments a month (so... it could charge me daily interest, but I could only try to pay back my debt five times a month...yeah, that’s fair). Fine, I just had to be a bit smarter about it. Having cleaned out most of the unpainted minis, I started in on the painted ones that I had from projects long ago abandoned. Even with that though, I needed to find other income streams. I looked around the house, the only thing that came close to miniatures in numbers terms was books. I’ve always been a bit of a book hoarder. I kept almost all my books, including ones that I knew I would never read again, even a bunch that I didn’t even like that much. Why? It didn’t matter now, they had to go! After a bit of searching, I found the best place for me to sell books was www.webuybooks.co.uk. A lot they don’t take and some they pay only pennies for, but overall, I was able to convert a lot of books into a good chunk of cash. Also, I found that if I just held onto some titles for awhile, they might take them later. I soon learned that they also took CDs and DVDs, so most of those went as well! I was also lucky enough to pick up a few allies in my war. One of my friends allowed me to sell some of his minis and keep 50% of the profits. My father also helped out, when he realized I was determined to kill my debt. (The prodigal son fund). Still, I am proud to say that I obtained most of the money myself. I sold off most of my gaming books. I sold comic books. Any time I used Tesco points or Nectar points, I immediately put a corresponding amount in my debt war fund. I cashed in all of my change; I sold off some collectable coins. I wrote a couple of online articles for a bit of cash. I refused to let up, because when you are beating the enemy back, never give him a chance to regroup. If you are paying off your debt, never let up until your debt is down to zero. If you stop, it will come back. That is the key, never stop, until the debit is dead! In the end, it took me about a year and a half to pay off that $7,000, but I did it. The day I won the war, a huge weight lifted off me and a felt a new sense of freedom. Along the way, I probably cleaned out 75% of the stuff I own, and actually, I’ve come to realize I’m happier without most of it. Just like the debt, these useless possessions were also weighing me down. So, the moral of my story: if you have debt, especially high-interest rate debt, you need to go to war. Now! It is so easy to get into debt. I did it, and I consider myself a generally intelligent, math capable person. It is hard, hard to get out of debt, and it only gets harder as time goes by. Even as deep in debt as I was, I kept buying stuff. I kept buying miniatures to throw on top of the lead mountain. Put simply, I was crazy. These days, I’m actually in the miniatures business. I make a few pennies every time a Frostgrave miniature sells. I hope people buy them because it helps me, and I think they are good figures, but, please don’t buy them if you are in debt, and please don’t go into debt to buy them. I assure you, you will be happier without the minis and without the debt. I also assure you, if you want them later, they will be there. There has been so much going on these past couple of weeks (UK Games Expo, my daughter's second birthday, the manuscript for the next Frostgrave supplement due...) that I have neglected to mention the Gnickstarter! This is the latest Frostgrave pre-order campaign. It's the first chance to order the newest supplement, Into the Breeding Pits, along with all of the new miniatures, including the new box set of plastic gnolls! 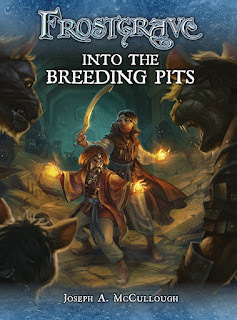 The Gnickstarter has already passed its first two spend goals, meaning that most people will be getting a free hyena and some free giant rats; however things get really interesting at the next level which brings in the Violent Fungus (hehe). You can click here to see all of the details of the Gnickstarter and order directly from North Star. You can also order it through Bad Squiddo Games (renowned for their customer service). Or through Sally 4th which is throwing in a few freebies of their own. If you are in the USA, you might want to order from Brigade Games. If you are in Germany, Miniaturicum is also offering the Gnickstarter. Later that day I was in Birmingham preparing for the UK Games Expo, the largest games fair in the UK. I was there with the team from Osprey Games, showing off both Frostgrave and our new slate of board and card games. I knew the show was 'big', but I have to admit, I wasn't prepared. Friday was busy, but easily manageable. The next day, the dam broke. Over twelve thousand gamers descended upon the show! The day flew by in a blur of cards, dice, coke, fun, and aching feet. By the end of the day, the stand was a wonderful disaster. Sunday was quieter, but still busy, and I watched as the stock of certain games dwindled down to almost nothing. (Check out Escape from the Aliens in Outer Space and Odin's Ravens). Then, when the show had almost ended, it was time for the awards. I knew that Frostgrave had been nominated for best miniatures game, but, in truth, I didn't like its chances. It was up against some tough competition and, given that the Games Expo is traditionally more of a board game show, I figured that the judges and voters would go for a more board game-like miniature games. So, it was with genuine surprise when Frostgrave was announced as the winner! 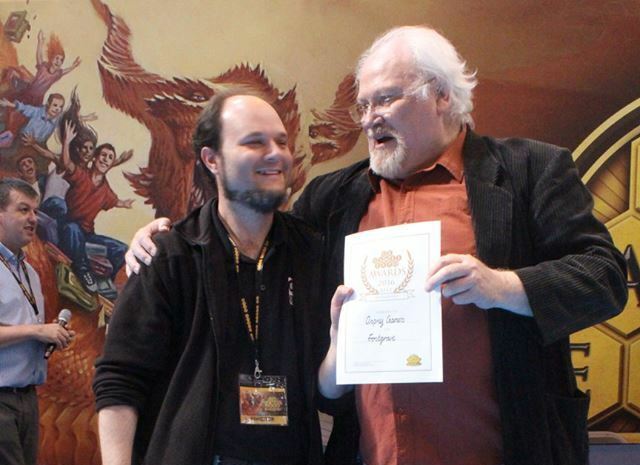 I went up on the stage and there to present my award was the Sixth Doctor himself, Colin Baker! Now, in general, I am not one to get star-struck. I'm not really bothered with autographs, and don't go out of my way to meet stars, but there was something special about standing there with Colin Baker. As a television Doctor, he was never one of my favourites, but over the last fifteen years he has become my favourite Doctor of the Big Finish audio adventures. For a moment, that young boy who discovered a weird British television show with 'the best monsters' came back in full! It was only a moment, but I told him how much I enjoyed his work with the audio adventures. He thanked me and asked me to keep listening. That's all I remember really. Now that I have had a couple of days to process, I'm not sure which was better - winning the award or meeting Colin Baker. Taken together, it is a day I will remember for a long time to come!